The First Presbyterian Church, built over 112 years ago, is the site of a unique presentation of Tiffany Windows. Adorning the sanctuary is the rare artwork of America's foremost designer of stained glass, Louis Comfort Tiffany, who came to Topeka in 1911 and produced these windows for the church. The windows of the sanctuary are decorated with Favrile glass, cutting the sun's rays into thousands of subtle shapes and colors. 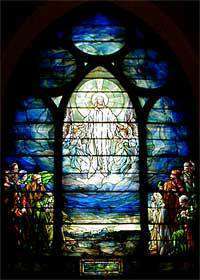 The First Presbyterian Church is one of the few churches in the nation to have its sanctuary decorated exclusively with Tiffany stained glass windows. Each window in its exquisite beauty is a sermon and a prayer as well as a treasured work of art. The windows display an iridescent quality, their hues and accents changing with the light outside or inside the sanctuary, even with the differing moods of the viewer. There is, therefore, no "ideal" time to view the windows, and, as long as even a glimmer of light flickers in the skies, the windows continue to work their charms. Each viewing, each journey, will reveal something new, something not seen before, some new meaning or nuance to the family biblical stories they depict. Hours: Windows may be seen 8:30 a.m. to 4 p.m. Monday through Friday. Guided tours available by advance request. Bus Parking - Handicapped Accessible.